Generally speaking, there are two very important nutrients that contribute to plant and algae growth: nitrogen and phosphorus. The best way to keep a lake healthy is to limit these nutrients from entering the water. Nitrogen is found in most fertilizers and improper septic runoff. Phosphorus is contained in many detergents. Inspect your septic system to be sure it is adequate to handle the load it receives. Invest in an upgrade or new system if yours is faulty or insufficient to meet your needs. Have your septic tank pumped as frequently as your septic service may advise—each system is unique and has different capacities. Maintain all components such as filter and pump as needed. Never bathe, shampoo, or wash pets or other objects in or near the lake, including boats, trailers, and vehicles. Water containing soap or phosphorus-containing detergent can run off into the lake, even beneath the surface of the soil. Use only low- or non-phosphate detergents in washing machines and dishwashers. Do not use fertilizer; cultivate shore fronts with natural vegetation as opposed to green, manicured lawns. Do not dump leaves or grass clippings or other vegetation into the lake. Do not burn brush or leaves near the shore, as nutrients remain behind to be washed into the lake water during the next rain. 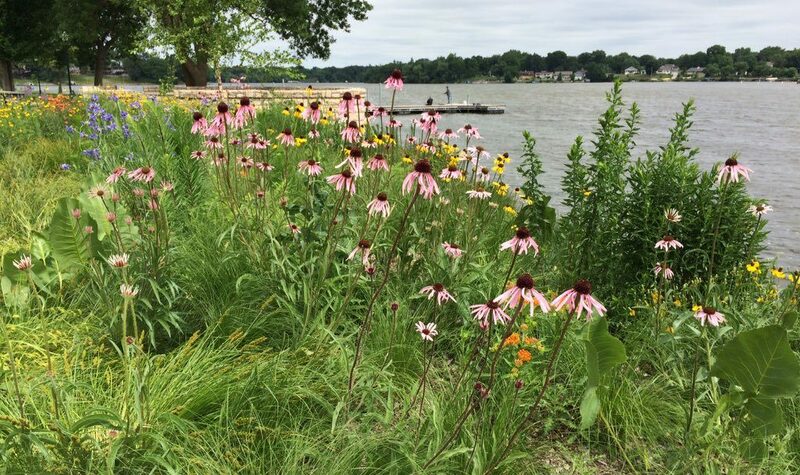 Maintain a buffer zone of native plants along the shore or create a rain garden to contain erosion and assimilate nutrients before they reach the lake. Keep land clearing to a minimum; revegetate bare areas and design curving paths or walkways to reduce erosion. Do not urinate or defecate in the lake and don’t allow pets to do so. Animals that produce large quantities of manure should not be housed near the lake. Do not feed ducks or geese; let them eat the naturally occurring food available to them. Their feces contribute nutrients to the lake and may cause swimmer’s itch as well. Do not use powerful outboard motors in shallow areas or near the shore. This churns up the nutrient-laden bottom layer and causes it to mix in with the overlaying lake water. In 2006, a study was conducted under the direction of the NH Department of Environmental Services of the effects of storm water runoff into the lake. The resulting report included an informative section on rain gardens and how they can reduce damage from runoff. You will find it on page 6 of the Storm Water Management Assessment Report. In bygone days, people were less informed about pollution and how various chemicals affected the purity and quality of lake water. Despite those beliefs, it is now generally understood that our lakes, streams, and water bodies need protection from human wastes of all kinds, and from excessive organic material and nutrients. During the long days of summer, the plants and algae in a lake will produce great quantities of oxygen through photosynthesis. In the fall, when temperatures drop and the water cools, this growth starts to slow and plants begin to die off. When bacteria and fungi take over to “clean up” the dead vegetative growth, they consume oxygen in the process and begin to deplete the lake’s oxygen supply. If there is too much plant material for them to handle, all of the oxygen could be used and the lake will die. The best way to prevent this is to limit the growth of plant and algae material by keeping excess nutrients out of the water. The lake will be able to clean itself without running out of oxygen because there will be far less vegetation to take care of.